Innokin iSub V is a sub-ohm tank with 0.5ohm SS316L coils. You can use it under VW/ TC modes. It delivers pure flavor and more clouds. The new Innokin iSub V is a sub-ohm tank with 3ml e-juice capacity which can be clearly seen in the sleek stainless steel, pyrex glass design. It adopts a 0.5ohm SS316L coil so you can use it under VW and TC modes. The iSub V comes with a recently launched easy top fill, dual adjustable air-slots with a no spill coil swap system. 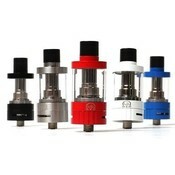 Users can enjoy an overall better vaping performance.